Xin Chao and welcome to Hanoi! On arrival you will be met by your Emerald Waterways representative and transferred to your hotel situated in downtown Hanoi for a two night stay. Relax at the hotel or explore the city, strolling along the tree-lined avenues or wander Hanoi's romantic West Lake. This evening, meet your Tour Director for your welcome briefing. Today you will enjoy a full-day city tour of Hanoi. The tour includes the main sights of the city including the outside view of by the Ho Chi Minh mausoleum, which is the historic figure and father of modern Vietnam. Continue to the small but iconic One Pillar pagoda and to the Temple of Literature. The temple of Literature was Vietnam’s first university and it was established to educate Vietnam's royalty, mandarins and members of the elite. The university functioned for an incredible 700 years and its gardens and well-preserved architecture offer a fascinating glimpse into Vietnam’s past. As part of EmeraldPLUS, you will enjoy lunch at KOTO (Know One Teach One), a unique restaurant set up to train and educate disadvantaged street children. After lunch, continue with a visit to Hanoi’s Old Quarter also known as the ‘36 streets’. Take a walking tour through charming Hang Be Market and around Hoan Kiem Lake, as well as a stop at Ngoc Son temple. This bustling area of narrow streets and alleys is home to literally thousands of small businesses and shopkeepers. It is a great place to explore with plenty of photo opportunities. This evening, enjoy a traditional Water Puppet performance. This morning after breakfast, leave Hanoi and travel to Halong Bay, where you will board your luxurious traditional style junk. Cruise through the bays and islets enjoying the stunning scenery of this magnificent region. Enjoy some tours offered onboard and learn more about the main livelihood of the locals in the area or relax on board. Towards the end of the day the boat sets anchor for the night among the karst formations. Dinner is served on board. Today, you will be transferred to your day trip boat tour with private crew and cruise to the bay’s most untouched areas. Enjoy swimming on quiet beaches, visiting water tunnels, fishing villages or kayaking. Lunch is served onboard of the boat by your private chef. Return in the evening hours after a full day of exploration to your traditional junk boat. Enjoy the fresh morning in the middle of the bay while having breakfast and cruising through the magnificent rock formations and back towards port. Bid farewell to the traditional style junk boat on Halong Bay and transfer to Hanoi airport, with a stop en-route for a light lunch at a local restaurant. At the airport in Hanoi, board your flight to Danang (Hoi An). Upon arrival, you will be transferred to your hotel in the historic port town of Hoi An and relax for the rest of the evening. Included is a three-night stay in Hoi An. Today start with our EmeraldPLUS visit to the Reaching Out Project. Reaching Out is an NGO established in 2000, which provides opportunities for people with disability to learn skills and gain meaningful employment. Visit their workshop and get a glimpse how this NGO helps the disabilities to integrate fully with their communities and lead independent and fulfilling lives. In the afternoon, enjoy a half day tour of Hoi An and see old merchant’s houses, the Japanese Covered Bridge and the Assembly Hall of the Chinese Congregation. Enjoy a day of leisure to explore Hoi An and its surroundings. Leave Hoi An for Hue, the former imperial capital of Vietnam. You will drive through Danang before crossing the Pass of Ocean Clouds and dropping down to the wonderfully photogenic fishing village of Lang Co. In Hue, you will visit the Imperial Citadel where the Nguyen Dynasty ruled between 1802 and 1945. As part of your EmeraldPLUS Take a cyclo (bicycle style rickshaw) from Dai Noi “Old City” to Tinh Tam Lake where the Emperors used to come to relax. Then later, join a boat trip to visit Thien Mu Pagoda. This evening, experience a traditional costume play Royal Dinner. Today, transfer to Hue airport for your flight to Ho Chi Minh City, formerly known as Saigon. Upon arrival in Ho Chi Minh City, transfer to your hotel to store the luggage. In the afternoon, you will have a guided tour of Ho Chi Minh City, starting with a visit to the city’s most iconic building: Reunification Hall. Formerly called the Presidential Palace, images of the building were seen around the world on 30 April 1975 when tanks stormed the gates as Saigon fell to the North Vietnamese. Then, stroll through the Ho Chi Minh City’s colonial quarter, walking past scenes of everyday life on the way. Admire the beautiful architecture of the Opera House, City Hall, the old Saigon Post Office, listen to the stories about the glory days of French Indochina and how that era continues to influence aspects of modern Vietnamese culture. 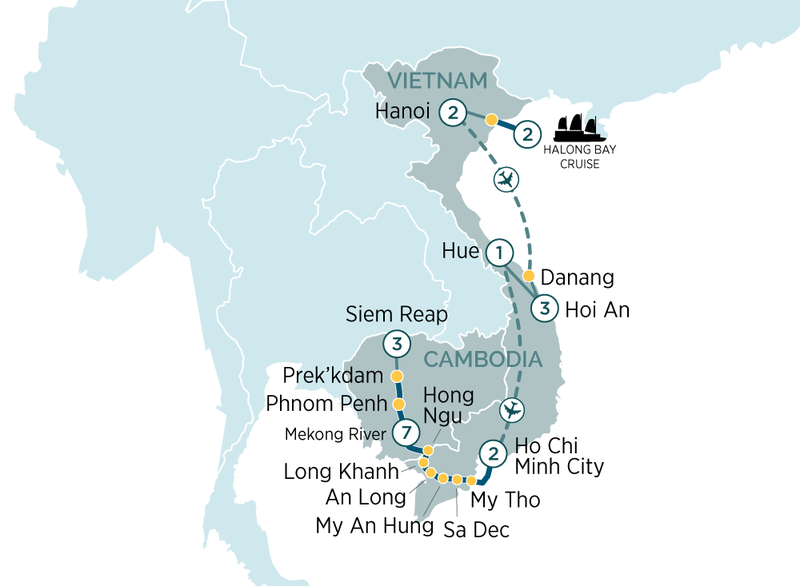 Included is a two-night stay in Ho Chi Minh City. Today, transfer from your hotel and embark on your Emerald Waterways award-winning river cruise Star-Ship and be welcomed by your Captain and crew. Set sail to My Tho in the Mekong Delta, and this evening, enjoy your first dinner on board with your fellow travellers. Your Tour Director will also conduct a port talk to review the activities and itinerary for the days ahead.